But Merzbow, now, he proof me right about Licht-ung I guess. I believe its not his first release on this label. Its been some time since I last heard Merzbow too actually, and perhaps for the very same reason as I didn't hear post rock or ambient house: maybe after a while you heard it. And believe me, I heard a lot of Merzbow. Now that hear this 10", I realize I missed that too, but perhaps that is due to the fact that there is something about this record which reminded me of some older Merzbow, the 'SCUM' double LP. On that LP Masami Akita cuts up his own old work and re-assembles it. The a-side starts out with similar cut-ups, before going into what seems to be an improvised guitar recording, filtered through the EMS Synthi-A. On the b-side drumming pops up, reminding the listener of the fact that Akita started out as a drummer, and did also play the drums on his 'Live In Khabarovsk' LP. Akita is on both sides in a totally free improvisation mode, and his tools of the trade - noise - is apparent, but not the main driving force of this record. It appears here, in the middle of his free play of improvised playing. Here too its a call out to play more, old, Merzbow. 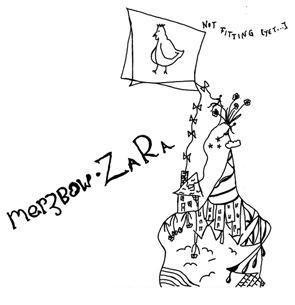 Said records for instance, and then 'Zara' again.